Collins Booksellers - Biology and Management of Invasive Quagga and Zebra Mussels in the Western United States by Wong, Wai Hing, 9781466595620. Buy this book online. 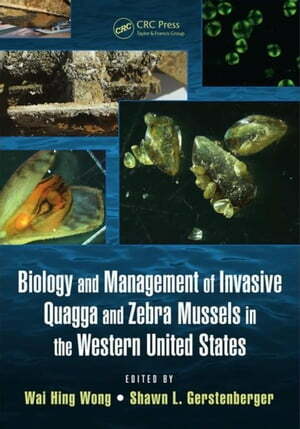 Biology and Management of Invasive Quagga and Zebra Mussels in the Western United States is a synthesis of the biology and management of invasive mussels from scientists and managers working on invasive quagga and zebra mussels in the western United States. Invasive dreissenid mussels have spread throughout southwestern United States at unprecedented speeds, and present a unique threat to native ecosystems. This book documents the efforts, both successful and unsuccessful, of individuals and agencies after dreissenid mussels invaded the West. Although the book is designed specifically for scientists and managers fighting invasive mussels in western waterbodies, it offers an opportunity for scientists and lake managers worldwide to compare successful strategies relevant to their unique situation. It includes guidance documents and protocols related to early detection, prevention, regulation, monitoring, and control of these invasive pests in the West. It compares quagga and zebra mussels in the western United States with those mussels colonizing the Great Lakes and European waters.